We rented the house for a family wedding in Monterey and were more than happy with the accomodations. Furnishings and home decor were beautiful. Would rent this again if ever back this way. Small can be really beautiful. Case in point: this dreamy little cottage in a quiet neighborhood just six blocks from the water. Furnished by our favorite designer in a soothing palette of soft blues, seafoam green and driftwood grey, you can’t help but relax here. The living room has warm golden bamboo floors and a wood-burning fireplace, and the skylit dining area seats four. The fully equipped kitchen includes a professional five-burner gas cooktop, and there’s a large patio with a gas barbecue and a table for outdoor dining. The master bedroom has a private bath with a jetted tub/shower; French doors in the guest room open to a deck with a peek of the ocean. A second bath has a deep tub/shower combination, and both bedrooms have natural, hypoallergenic Queen-sized mattresses imported from Italy. The ocean and the Coastal Recreational Trail are less than a ten minute walk, and Pacific Grove’s shops, galleries, restaurants, movie theater and Farmer’s Market are just minutes from your door. Cozy living room with wood burning fireplace. Master bedroom has an imported Italian mattress. Master bath has a jetted tub. Second bedroom has access to the front deck through French doors. Second bath has a deep tub with a shower. Entry area has a window seat and a small desk. Two decks - one in front and one in back (with barbecue). Updated cottage close to town and the water. A toast to "Seaglass Cottage." All the wonders of Pacific Grove and Monterey are minutes away. Beautiful home nicely done. We enjoyed doing activities in the Monterey Bay area during the day and then cooking in the kitchen and relaxing at night. Loved having a fireplace and a glass of wine after dinner. Nice two bedroom and two baths that allowed us to have guest come and stay the night and enjoy the area with us. I hope to return and stay there again. We loved the Seaglass Cottage!!! We had everything we needed and the house was absolutely beautiful. Convenient to the ocean, walking trails, and town. The only recommendation I would make is the bed in the second bedroom (facing the street) really needs replacing. It caves in the middle and after three nights of very little sleep, my back hurt pretty bad. I don’t have back problems, but this is something easily fixable I think. If there is a new bed next year, we’ll definitely stay again! We're so sorry to hear you had problems with the bed and wish you would have contacted us during your stay. The mattresses in both bedrooms were imported from Italy just a few years ago, so we installed additional supports under the frame which should solve the issue. This property was very lovely and clean. It met all of our needs. I would recommend this property. We would stay at this property again on our next trip to Monterey. Seaglass Cottage was a great find. Really nice, quiet neighborhood. Although there isn't a garage, street parking was plenty and easy.Well furnished, small but doesn't feel like it.... tried to book for our next visit, but already booked! I would highly recommend. The Seaglass Cottage was perfect for myself and my 2 daughters. The house decor was beautiful. The deep jet tub in the master bath was a nice treat after a long day of travel. Unfortunately, the weather was colder than expected for most of our stay, otherwise, we may have used the beautiful back patio more. The house is about a 5 min. walk downhill to the coastal trail. At first, I thought it would be nice to be closer to the water; however, family who stayed in a house right near the trail said the seagulls woke them every morning. I would definitely recommend this house to anyone & would stay here again. The house is in a great location for walking to the beach or downtown Pacific Grove. If you like cooking your own meals the kitchen is very roomy and well set up. We were not able to use the back patio since the weather was pretty overcast the whole time. The house is decorated very nicely with a calming, beachy color palette. We would recommend this location. The Sea Glass Cottage is a really nice property; very comfortable, well equipped, quiet residential neighborhood, great location. Our family really enjoyed this modern, cozy cottage, with a nice outdoor patio and front porch. Beds were very comfortable and the kitchen was well equipped. Perfect place for a family of four, or a couple looking for a quiet get-away. The only issue we had was running out for propane for the outdoor grill. One quick e-mail and it was remedied. Monterey Rentals were very responsive to all our questions/request. Loved the bottle of Sea Glass wine that was part of our welcome gift. Would highly recommend this Cottage to anyone/any family. We throughly enjoyed our visit to PG. The Seaglass Cottage provided us with a very nice place to stay. Wonderfully centrally located, easy walk to restaurants on Main Street.The house itself is very nice, nice outdoor private patio, really nice well equipped kitchen.We would definitely stay here again on a next trip to PG. This house was exactly as described. Very cozy (quaint was often used) clean and very comfortable. The kitchen had a very nice stove, refrigerator and other appliances. The house was small, but that was what we wanted and with the 2 bathrooms, it made it seem larger and was just perfect for us. The beds were a little soft for our taste, but that is a preference, not a complaint. The back yard was small, but well cared for and was a nice place to sit and relax. I would recommend this home to anyone wanting a getaway for 2 couples but NOT for a family of 5 or more. The cottage is ideal for 2 couples. The colors throughout the home are so peaceful) As two short seniors, neither my friend nor I could get into the deep tubs.) Secondly, I would change the table settings already on the table. It limits any other uses, such as playing cards or board games. It could also be unhygienic if the dishes are on display for any length of time. This was our second stay at the Sea Glass Cottage, and it didn’t disappoint. It’s on a nice quiet street. In fact, a doe followed shortly by a buck walked down the street shortly after we arrived. We enjoyed the fireplace log and wine left as a welcome gift. Being able to walk downtown is nice too. Hopefully it will be available on our next visit! Arriving at Seaglass Cottage was a perfect start to our vacation. Very clean, great for couples and families, with plenty of indoor and outdoor space, and walkable to ocean.Great restaurants in Pacific Grove. Monterey 10 minute drive, 17 Mile Drive is a must drive and is 15 minutes to P.G. gate. Definitely a must see. Pebble beach 15 min. away.First time VRBO and would highly recommend working with Kyle. Everything ran smooth and would come back in a heartbeat.... A great 5 star location!!!!! Stayed here and had an excellent time. The place was clean, quiet and everything we had hoped for. We would definitely stay here again. Seaglass was ideal for our 10 day golf trip. The home was very clean, cozy and calming tones made for wonderful ambience after a day on the golf course. Monterrey rentals was easy to work with and very responsive to anything we might need. We would definitely put this trip on repeat!! Came to Monterey to play golf at Pebble Beach and Spyglass and wanted a home close to the courses. Seaglass Cottage was close to the courses but also to the downtown area activities. The home was very comfortable for 2 couples. If we're in the area again it's a home we'd stay at again. A stay on Monterey St. in PG. Nice clean, comfortable home. Good location. Enjoyed the weekend. Very quiet neighborhood. Seaglass Cottage was perfect for our recent stay. It was clean and provided a good location for our trip. I had to call maintenance about a couple of minor items and the gentleman was very kind and responsive. Communication received from Monterey Rentals was good. My only recommendation would be to improve the landscape out front and clean off the front porch and back patio area. These areas needed to be cleaned off prior to use. The house is well stocked, great kitchen etc. would definitely stay there again. Thank you! Thank you so much for your comments: we have addressed the landscaping issues and alerted the housekeepers to clean the porch and patio between guests. We hope to see you again soon! The cotttage is a warm, cozy two bedroom. It has all the amenities we could ask for during our visit. Great location in a quiet neighborhood. Just lovely. We loved Seaglass Cottage! Comfortable, great decor and everything we needed was provided! Seaglass Cottage provided the perfect stay for our family of four. It is in a perfect location with easy access to all the main attractions. This was our first VRBO experience, and we will make sure to do this again; much better and more affordable than a hotel! This house is perfectly laid out with a comfortable living room and plenty of space both indoors and outdoors patio to accommodate other local relatives for meals and and getting together. This also allowed us to save a lot of money on dining out as were able to prepare many home-cooked meals there. You can't go wrong with this beautiful property! A true vacation escape! Lovely decorated and extremely cosy! We absolutely loved our stay in the Seaglass Cottage. It's located in a nice and quiet neighbourhood just a few blocks from the ocean. Groceries, restaurants and shops reachable within five minutes. The cottage has everything you need and more. It is perfectly equipped and the decoration is outstanding and of great style. Towels, linens and matresses are of good quality. We also loved the comfortable deckchairs in the backyard. We would certainly recommend this accommodation to our friends and are very likely to rent it again ourselves next time we're in the area. We loved this little place! Clean and well decorated! Comfortable beds! Quite neighborhood! Loved that we were within walking distance to the town of Pacific Grove and ocean! The cottage is warm and wonderfully decorated! Perfect for a couple or two! There was 2 couples sharing this rental which was perfect for our needs. It had everything we needed. Comfortable and cozy. Loved the location. Loved walking along the ocean where we saw the harbor seals and their pups. Close to caramel and caramel valley for the wine tastings. We would highly recommend this. Pacific Grove is a perfect spot to stay on the Monterey peninsula. This cottage was ideal for our party of four. The two bedrooms and bathrooms were beautiful. The washer/dyer were very convenient. I would highly recommend this rental. Beautifully presented cottage in quite residential area minutes from the sea at Pacific Grove.All amenities supplied including a nice selection of books and games.Very nice ambience and decor throughout. The myriad of TV control buttons with various digital boxes defeated us but was not a problem as TV not a priority whilst there. Would definitely recommend this charming cottage and lovely location. 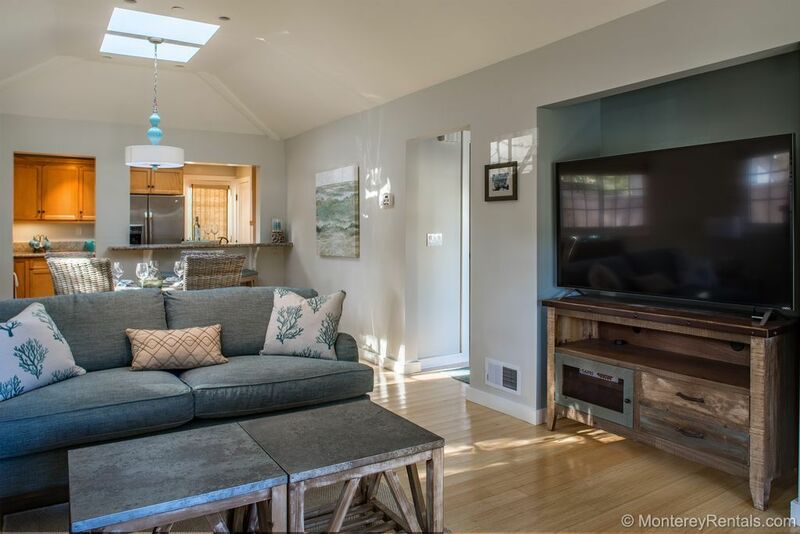 This is a great cottage which is conveniently located in the heart of quiet Pacific Grove. Located only a couple blocks off of Lighthouse Ave it is within short walking distance to some of the best cafes, boutiques, and quaint shops in downtown Pacific Grove. Only a 5 minute drive to bustling Monterey and the Aquarium and only 10 minutes from Pebble Beach. The Seaglass cottage is one of the loveliest vacation rentals we have had the pleasure to stay in. The decor is stunning and absolutely spotless. It was extremely well outfitted and in a perfect location .The staff at monterey rentals went out of their way to accommodate us.I can't say enough about this exception property. Seaglass Cottage was even better than the pictures. It is located in a quiet, central Pacific Grove location with well appointed furniture and beautiful remodeled bathrooms and kitchen. We really loved walking around the cute neighborhood, the easy walk to downtown and the close proximity to Monterey Bay. We hope to return soon for more beautiful days at Sea Glass Cottage. Definitely would go again and recommended this place to others. Perfect size for two couples, good location, neat and clean. Great experience working with the rental company, easy check in and out, and everything was as promised or pictured. The Seaglass cottage was beyond our expectations. It is exactly as shown in the pictures but it is even more charming, fresh, and clean than we imagined. And, they had everything so fully equipped. From the outside it is an old cottage look. From the inside, it is very cleanly and nicely decorated. The full kitchen is equipped with every implement and dish and utensil that you would need. They even provided a starter Duraflame log for the fireplace. Very professional, very fun! Four sisters spent four wonderful days at this delightfully decorated, quiet, close to everything home. We did not want to leave! Beds comfortable. Clean and with everything one would need to make a meal in the AM or lunch and dinner!!!! This property not only met, but exceeded our expectations. Comfortable and cozy, with well thought out decor. Two couples were able to share, with each having our own bathroom. The ocean can be viewed down the street, and you can walk to town to shops and restaurants. We were amazed at how quiet it was at night. We stayed at this beautiful, very well appointed and maintained cottage style home for just 2 days, absolutely not long enough.It is situated within an easy walk of Pacific Grove Beach and if you are fit enough the walk to Monterey is not long around 30 mins in total from the house to the centre.The house itself is very comfortable, the beds gave us a good couple of nights sleep and the living/dining area is what you would expect from a well priced listing.The kitchen comes with all you would expect, fridge, freezer, cooker, extra such as condiments are almost expected these days, who needs to go shopping for salt and pepper.We thoroughly enjoyed our stay we just wish we had had more time, it is certainly on our list for future visited.